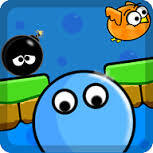 Play the new Jump’n’Spin ads free (Full Version). Move the player on the trampoline and make acrobatic moves in this gymnastics game. Swing and spin from the bars. Jump with the rope. Features:-Jump-Spin-Gymnastics-Space physics-Trampoline-High bars-Multiple levels-No Ads. No external links.Timing your jumps well will result in interesting gymnastics gravity-defying moves by the spinning gymnast. This is a must try move if you want to really enjoy the game. Avoid the rope when jumping to acquire height. Try to land on the rope when spinning and observe amazing physics driven movement. Try to jump at least 4 times before making spins.HOW TO PLAYSwipe to move the gymnast. Right after the player touches the trampoline, swipe again to attain a higher height. Swipe again until the gymnast is above the rings then let her execute some fluent spins.